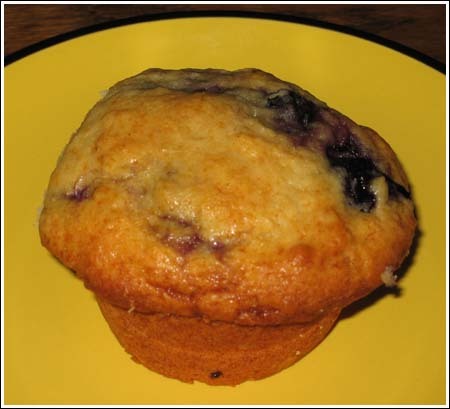 A very good recipe for basic blueberry muffins. These are rather large, which is a good thing in my opinion! They also have nice crowns. Preheat oven to 350 degrees F. Spray 12 muffin tins with flour-added cooking spray. In a large mixing bowl, sift together the flour, baking powder, baking soda and salt; mix well. In a medium mixing bowl, whisk together the sugar, butter, milk, vanilla, sour cream, eggs and yolk. Pour the wet ingredients into the dry and fold gently with a rubber spatula until the dry ingredients are mostly moistened. The batter will be lumpy and there will be streaks of flour. Choose an add-in. I used blueberries, but you can use a cup and half of other types of frozen fruit. Fold add-in into batter. Using a measuring spoon for scooping, scoop batter into tins. It should be slightly stiff and go up and over the top by about 3/4 inch. Bake for 30-35 minutes. Let the tin cool on a rack for 15 to 20 minutes. 3 cups confectioner's sugar plus one of the liquid ingredients below.